A meadow is the perfect place to play hide and seek - there are bridges to creep under and masses of wildflowers to use for cover. 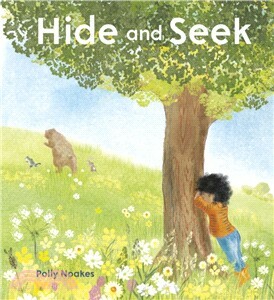 In grass high enough to conceal a bear, the protagonist must use all of her senses to track her animal companions! She can smell them, and hear them, but she can't quite find them. Can you spot the stealthy wolf on each spread? Will the girl find her friends, or will the wolf find her first?